Location, Location, Location!!! On a premium over-sized lot backing to woods this fabulous Bradford Grand model home is in a perfect location with privacy in a community setting. Before even entering the home you will be impressed with the attached 3 car garage and welcoming landscaping. As you enter this immaculate home you are greeted with hardwood floors throughout the first floor and vaulted ceilings. 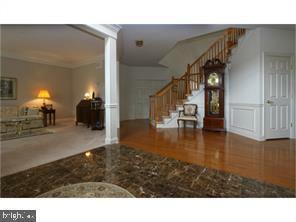 This center hall colonial features a foyer that opens to both a dining room and living room space. Also on the main floor is a half bath, laundry room, double door entrance to a roomy office and a living room with a fireplace and vaulted ceilings open to the second floor. The granite kitchen has beautiful upgraded 42 inch wood cabinets with plenty room for storage and counter top space, tile back splash, recessed lighting, large kitchen island, all new appliances and breakfast area which is perfect for entertaining with access to the backyard! Up the turned grand wooden staircase you will find 3 generous sized bedrooms, plenty of closet space and a full bath with tub shower combo and tile floors. The luxurious master bedroom is something that you will not want to miss with plenty of natural light, THREE walk in closets, an in-suite full bath and 2 beautiful columns separating the sitting room and master bedroom . The bathroom suite features his and hers vanities, soaking tub, a stall shower and tile floors. Extended driveway accommodates up to 10 vehicles for off-street parking. Newer carpet and freshly painted with poured concrete basement with walkout! 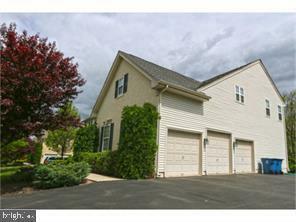 This home is only minutes away from downtown Doylestown and easy access to New Jersey, New Hope and Philadelphia areas! Listing courtesy of Real/Pro Real Estate, Llc.